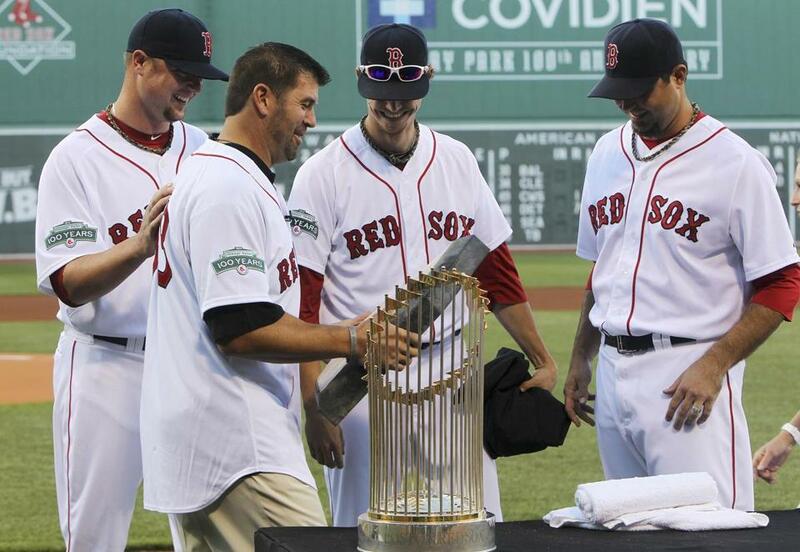 Pitchers (from left) Jon Lester, Clay Buchholz, and Josh Beckett present Jason Varitek with home plate from his final game during pregame ceremonies. They sat in white folding chairs that circled home plate, 21 in all, like a half-halo of family and friends guarding the dusty amber battleground Jason Varitek patrolled for years. And when the captain finally emerged from the dugout, wearing khakis and his Sox jersey, the red “C” still stitched into the fabric, the crowd stood and cheered. When he does watch Saturday’s ceremony that honored the former catcher who retired in March, Varitek will see the taped video messages from Nomar Garciaparra and Derek Lowe, the lengthy tribute set to “You Raise Me Up,” and plenty of career highlights, from the Little League World Series to the College World Series to him leaping into Keith Foulke’s outstretched arms as the Sox broke an 86-year curse in 2004. Varitek’s three brothers wore his three All-Star jerseys, one for each year. A tarp that said “TEK” covered the visitors’ side on-deck circle. On the home side, “33.” Nearby, the two World Series trophies glistened, the culmination of a storied career that saw him catch an MLB-record four no-hitters and set team records for runs, hits, homers, and RBIs by a switch-hitter. Varitek received the home plate from his final game, a $25,000 donation to the Children’s Hospital in his name, and golf clubs for retirement. Out of the center-field gate, they drove a red Ford F-150 truck, and parked it under the Green Monster line score that read, in white block letters, “THANKS TEK.” His three eldest daughters stood behind the clear podium together, and called him a legendary dad for brushing their hair and tying their ponytails. Catcher Jarrod Saltalamacchia, who spent some time under Varitek’s tutelage, still carries Varitek’s hand-me-down work ethic. After Varitek spoke, they invited him to the mound to throw out the first pitch, this time from the other side. In a role reversal from Sept. 24, 1997, Varitek’s major-league debut, Tim Wakefield crouched behind the plate to catch, and held down four fingers. Varitek threw him a knuckleball that bounced once. Then Varitek hopped into the bed of his shiny new truck and sat beside his family on a ride around the park, stopping by the Sox bullpen for more hugs, waving the whole way around. Alex Prewitt can be reached at aprewitt@globe.com. Follow him on Twitter @alex_prewitt.